Despite the number of local activities planned for this year’s Veteran’s Day commemoration (see below), the festivities will be dampened as we remember two additional Oklahoma service members who were recently killed in action, and who are returning home for the last time, to be laid to rest. American Legion Post #142 in Hominy, Oklahoma honors Sgt. Christopher Gailey and Spc. Sarina Butcher. The nearby community of Ochelata will be burying one of their sons this week. The funeral for Sgt. Christopher Gailey, 26, will be Saturday, November 12th at 2:00 pm; at the Church of Jesus Christ of Latter Day Saints, in Bartlesville. 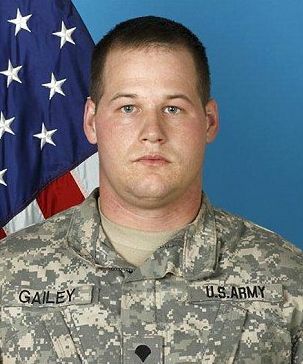 While a Specialist, Gailey was killed in Afghanistan on November 1st, 2011, after an IED detonated near his military vehicle. Gailey was described by friends and family as a proud father of a three-year-old daughter, named Ally. He was also noted to be one of the best guys around, with a fondness of for the great outdoors. Gailey’s casket will be returned to Oklahoma on Wednesday afternoon, November 9th at the Tulsa Air National Guard base at Tulsa International Airport. He has been posthumously promoted to Sergeant. Also killed in the same IED incident, was Pfc. Sarina Butcher of Checotah. Butcher was a 19-year-old mother serving with the National Guard, supporting her three-year-old daughter and career dreams of being a nurse, when she was killed during a resupply mission. Described as a much-loved daughter, sister, granddaughter, and mother. In her 18 months of service with the Guard, Butcher stood decorated with several ribbons and awards. She has been posthumously promoted to Specialist. Spc. Sarina Butcher’s name will be an unfortunate note in the history books. She is the first female Oklahoma National Guard soldier to be killed during wartime and is also the youngest Oklahoma citizen-soldier to die in combat in Iraq or Afghanistan, according to an official release. Women were first allowed to join the Oklahoma National Guard in 1971. Both, Gailey and Butcher, were assigned to Company F, 700th Brigade Support Battalion, 45h Infantry Brigade Combat Team based in Sand Springs. Together, they are the 17th and 18th military members from Oklahoma killed in action, in 2011. National Guard Spc. Joshua Michael Seals, 21, from Porter. KIA on 8/16/2011. National Guard Pfc. Tony J. Potter, Jr., 20, from Okmulgee. KIA on 9/9/2011. National Guard Spc. Christopher D. Horton, 26, from Collinsville. KIA on 9/9/2011. National Guard Sgt. Bret D. Isenhower, 26, from Lamar. KIA on 9/9/2011. National Guard Sgt. Mycal L. Prince, 28, from Minco. KIA on 9/15/2011. National Guard Spc. Francisco J. Briseno-Alvarez Jr., 27, from Oklahoma City. KIA on 9/25/2011. Marine 1st Lt. Ryan Iannelli, 27, originally from New Jersey. KIA on 9/28/2011. National Guard Pfc. Sarina Butcher, 19, from Checotah. 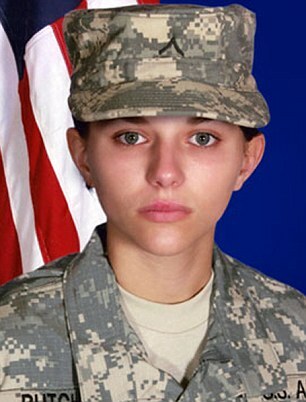 KIA on 11/1/2011. National Guard Spc. Chrish Gailey, 26, from Ochelata. KIA on 11/1/2011. The date of death for 2nd Lt. Jered Ewy is NOT 6/29 but is 7/29. Please get it corrected if you are going to post it. Thank you for bringing this to our attention. The date has been corrected.